A full-featured iOS data transfer software, compatible with all iOS devices . 4Videosoft iOS Transfer is one full-featured iOS data transfer software, compatible with all iOS devices like iPhone iPad or iPod touch. The program enables you to transfer lots of data, including contacts, photos, SMS, music, videos, photos, ringtone files, etc. between iOS devices and computer. In addition, the program can also help you to transfer files among iOS devices, and even transfer files to iTunes as well. What’s more, 4Videosoft iOS Transfer can transfer files in batch, which saves both your time and space. 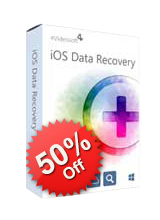 4Videosoft iOS Data Recovery is the advanced iOS data recovery tool to recover the deleted iOS data, like contacts, messages, videos, notes, call history, photos, voice memos, safari bookmark and more. Multiple iOS devices are supported, like iPhone X, iPhone 8 Plus, iPhone 8, iPhone 7 Plus, iPhone 7, iPhone SE, iPhone 6s Plus, iPhone 6s, iPhone 6 Plus, iPhone 6/5s/5c/5/4S/4/3GS, iPad Pro/Air/mini, iPod touch. You can get back the deleted data files from iOS device, iTunes backup files, as well as iCloud backup files using this software. 4Videosoft Android Data Recovery is an excellent Android data recovery program, which enables you to recover the deleted Android files, like contacts, call logs, messages, documents, etc. from Android devices. In addition, it enables you to recover gallery images, videos, songs and other media files. This program highly supports multiple Android brands, such as Samsung, HTC, LG, Sony, Huawei, etc. 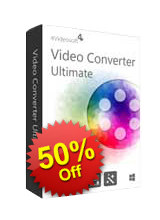 4Videosoft Video Converter Ultimate can be your best video converting software, which lets you convert any homemade DVD and video file to a MP4, MOV, FLV, WMV, AVI, M4V, MP3, M4A and other video or audio format. In addition, you can use the software to download videos from YouTube, Vimeo, Facebook and so on. The program also offers some useful editing features, so that you can rotate, crop, watermark videos, etc. You are also enabled to enhance video quality by adjusting video contrast and removing video noise. As one most useful screen recording tool, 4Videosoft Screen Capture lets you record on-screen activities and grab audio on Windows 10/8/7/Vista computer. Whenever you want to record streaming videos from YouTube, Netflix, etc. or make a tutorial video, this software will be your best choice. The supported output video formats are WMV and MP4. Besides, it is very convenient for you record music or other audio track from Pandora, SoundCloud, Spotify, etc and save the recording as an audio file in MP3/WMA, AAC and M4A. 4Videosoft Blu-ray Creator is the professional Blu-ray tool for you. It enables you to burn any video to Blu-ray disc or ISO image files, such as MP4, MKV, WMV, etc. With the program, you are able to get a customized menu by downloading free menu templates, and edit your Blu-ray movies by adjusting its brightness, saturation, contrast, audio effects, etc. In addition, you can directly watermark video, or split video length into several clips according to your need.